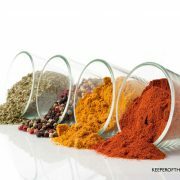 Several years ago, my husband and I discovered that the clutter in our homes was eating away at our peace and enjoyment. It distracted us, made us grumpy, created extra work and messes, and just generally detracted from our lives. During that season, we began to really tackle all the stuff in our home and view it with new eyes. Do I truly find this beautiful or useful? How long has it been since I actually wore this shirt, used this pan, cared about this book? Will I even miss these things if they’re gone? What is this clutter costing me in terms of stress, cleaning, storage, maintenance, mental sanity? Is it adding to my life or taking something away? 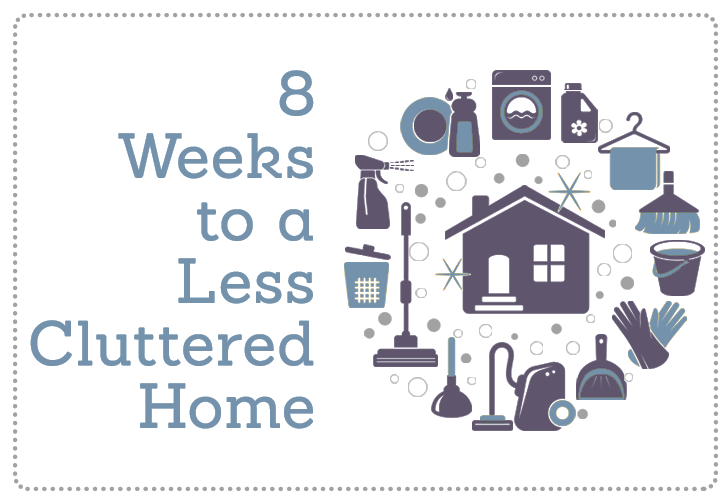 At the time, we went through our things using this “8 Weeks to a Less Cluttered Home” plan that I created, mostly for myself. But I also shared it with my readers and in the years since, it’s become one of the most popular things on the blog! And so, we’re back in “less” mode, ready to declutter again. 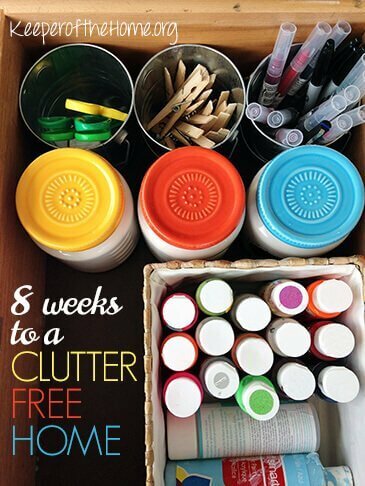 With that, I thought it was high time I shared this post again, along with the FREE printable file that goes with it, so that you can also work through your home systematically and get rid of what you don’t really need. Keep reading to learn more about how the plan works, and then to download the file for yourself! This fall, my husband and I began to go through our possessions, attempting to really clear out the unnecessary items as much as possible. We got rid of almost 2 van loads of stuff, which is hard to believe. Even harder to believe is the fact that we don’t miss any of it. At all. Instead, we found that we enjoy being in our home more, and we spend less time cleaning and maintaining things. Having less proved to be a very, very good thing. So good, in fact, that we’re not finished yet. This summer we’ll be going through our home in a detailed, step-by-step decluttering process. Over the course of 8 weeks, or 40 days (not including weekends), we want to purposefully assess each area of our house and our possessions, and pare down to what we truly need, use and love. Everything else? It will be sold at a garage sale, donated to others, or taken to the dump as a last resort. Are you eager to free yourself from the demands of your material possessions, so that you can fully enjoy and engage in the parts of your life that are most important? Relationships with family and friends, time spent with the Lord, serving and giving to others, opening your home for hospitality, having time for creativity, for rest, and for purposefully pursuing the things you are most passionate about. When we free ourselves from “stuff”, we have so much more to give to the things that really matter. 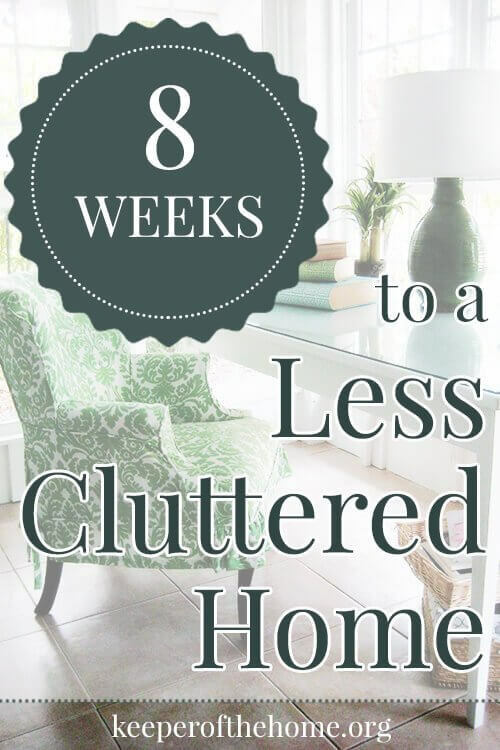 Will you join me in 40 days of decluttering our homes? At the end of 40 days, we can expect to be released from 400 things that we don’t need… can you imagine the effect that this will have on your home and life?! I do realize, though, that it’s summer. We want to be outdoors, enjoying time spent with loved ones, soaking up some sun, and having a whole lot of fun making memories. I don’t want to spend days or weeks cooped up in my house as I sort through what we own. That’s why I created a plan to work through your house very systematically, but in 30 minutes or less per day. There might be the odd task that is a more daunting one for you and it will require more time. On the other hand, some of these tasks will be a piece of cake for you, and could be finished in 10 minutes flat. On average, most tasks shouldn’t take more than 30 minutes, and the areas that I think will require extra time have been broken down into bite-sized or multi-day tasks. Is your home in need of some serious decluttering? Are you anxious to get rid of all that extra stuff crammed into closets and under beds, but not sure where to start? To guide you through the process, I’ve created a PDF file, sort of a mini-ebook (8 pages) with some thoughts on decluttering and getting started, tips on working through the process, and then a step-by-step 40 Day Plan. Get your copy by clicking on the link below. I made this plan detailed and specific because that’s how I work best. If someone just tells me to take a week to declutter my house and go through it room by room, I’ll get lost and overwhelmed. This 40 day plan was created by mentally walking through each and every part of my home. For example, the kitchen is broken down into bite-sized pieces over the course of 7 days (with individual tasks like drawers one day, kitchen linens another, and cookbooks/recipes on another). Clothing is split up into individual closets, dressers, and even a specific day for shoes. I included the random areas, like the medicine/supplement cabinet and first aid kit, videos/DVDs/CDs, and holiday supplies and decorations. Every day, you’ll know exactly what to work on. It’s all spelled out, and organized into manageable tasks, to keep it from being overwhelming. Honestly, I’m excited to begin. Our household purge last fall was such a positive thing and I am eager to remove more and more of the clutter from our home. I’ve also set some goals for what I want to use the garage sale money more… even more motivation! I hope that many of you will join me on this challenge and experience along with me the increased freedom and peace that comes from taking control of your belongings, instead of letting them control you. You will be happily surprised by how much more less really is. Is your home in need of some major decluttering? Do you have any specific goals you’d like to meet, financially or otherwise? Home management or meal planning software? What a great challenge — can’t wait to tackle some of this. One suggestion: when you call your local thrift store to see what they accept, be sure to ask about clothing with stains or that is worn out. Most stores will accept it and recycle it into insulation for homes or into pet bedding at animal shelters — a much better use than the landfill! I like to put all those clothes in a separate bag labeled “rags” to save the store employees time. I am thrilled to be a part of this clutter-free movement! I just added another daily reader called TheFlyLady to go along with KEEPER. I am determined to declutter and live more minimally making our footprint less lasting! Thanks Stephanie! Thank you thank you thank you for doing this! I have been wanting (and trying) to de clutter for so long. I did a decent size purge a few months ago, but with 2 little ones it has been too overwhelming to tackle the big stuff. This is exactly what I need to finish the job! You’re so welcome! I know that it can be overwhelming to even know where to start. Hope this helps! For the last three months I have been getting rid of things that were in our basement and it looks a lot better. It still has a long ways to go but I’m truly enjoying what it looks like. Over the weekend I went through most of the house (closets and under my bed haven’t been touched) and got rid of lots and lots of stuff. It is all in my car right now for me to take way to the goodwill. I would like to follow your 8 week plan. That way I am completely done with the house by school starts. By the way, I feel great! This cleaning has made me feel renewed. We have been working on this at our house too. It is wonderful! Can’t wait to see what encouragment I can get from your ideas! My husband and I have recently been talking about doing this, but haven’t come up with a plan yet. With baby expected to arrive in about 8 1/2 weeks, we might try to take a more accelerated approach to finish based on this plan (hopefully!) before the arrive of our precious gift! Any recommendations on approaching family to maintain a de-cluttered home? We’ve talked with our families, but my family doesn’t get it, and whenever they come for a visit (about once a month) they come with a carload of toys, gadgets, and clothes – most of which I label as junk. I want to be thankful for their generosity, but I don’t want most of it in my house. If the first step of open communication doesn’t work, then what’s next? They also look for the things they give us at the next visit, and I’ve seen the look of frustration when I mention that it just wasn’t something we needed. I want to demonstrate Christ to them more than anything. Thanks! For family giving gifts, we limit each family member or group (grandparents for example) to bring one gift with them when they visit. Our families live far away and visit several times a year. We’ve found that stating that we love them giving gifts is wonderful, but we don’t have an endless amount of space in our small home. Also, we’ve made it a point (at their request) to let them know if we needed something. For example, we let the grandparents purchase the first bike. We’ve also found that suggesting activities as gifts works well – a zoo membership, a trip out fishing, etc. Thanks for the suggestions Angie! Some have worked well with my in-laws, like I mentioned in the earlier post, it’s my side of the family that are the biggest offenders. I’ll try asking to limit gifts to one per visit to see if that helps. I’ve mentioned our small house before, but my mom finds it acceptable to store box after box of toys in the attic or basement and offered to organize those spaces to accomodate the toys she wants to give. Since then I have emphasized that my husband and I really believe that less is more. I’ll keep praying for a way to address the issue in love. This is perfect timing!! We have our second child arriving in about 6 weeks so I might end up doing 2 sections in a day, but I can’t wait to get started! We need decluttering badly! We’ve recently begun doing this, in the last few weeks. I’ve been writing about it a little. 🙂 We are preparing to move, and want to take only the items we really need and want with us. The extras…need to go. We already have a few boxes full in the garage, which will be sold or donated. I’ve taken a load of cardboard to the recycle center too. I’m trying to tackle one “problem area” at a time. Over the weekend I cleaned off my dehydrator (a huge “catch all” spot for me) and now that whole area is clean and nice! I’ll be tackling the top of my fridge, the top of the fish tank, and some surfaces in my bedroom this week too. I’ve already done two of the bathrooms, and the kitchen cleaning cabinet. One bit at a time. 😉 I’m so excited to be making my life simpler, and to rediscover items I’d actually use if I had been able to find them! I am really looking forward to this too. Sara, I have the same problem, I got so mad when I read a professional organizer say that no one really cares if you give the stuff they gave you away, in my dh’s family they do. They are looking for it, asking if we like it, and how much we use it when they give us certain things, especially if they are toys for dd. Is there any way you can share your progress with this challenge with them as you are doing it, and share how much better it has made you feel to have less stuff, and only the stuff you need and use frequently? I’d also add that since you love the challenge so much, you and your family are making it a goal to only allow items you love and into your house. That way it may seem like you are sharing your journey with them, instead of condemning them for buying you more junk. If you have a good relationship with them, and they still bring you more stuff can you try the “This is great, and I really appreciate it, but I would feel so much better if it went to someone who would use it and love it more than I do “conversation? I could try that with some of my family, and they wouldn’t get offended, but some of them would. Oh, I won’t be needing this. There’s no clutter in my house. JUST KIDDING!!!! Actually, this is perfect timing for me since we homeschool year round and our “year” starts July 1st. This is my planning week, so I’ll be inserting your 40 day schedule into our chores. I’ve looked over the pdf and so many of these things are little “missions” the children can do! Perfect! Thanks so much for the great list! Yes, definitely lots of small, simple things that kids can help with! And I’m so glad there’s no clutter in your house at all. LOL! LOVE clearing out clutter. It was the best thing after my divorce, to ditch EVERYTHING and start over. My new home is wide open with no STUFF and I LOVE that open, minimal feeling. This might just be the incentive I need to clear out the clutter. We may be moving in the near future and the idea of packing up all of this “stuff” makes ill. The less we have to move the better. I’m looking forward to getting started. I am so very excited about this, and very much in need of it! Love this challenge, Stephanie!! I am planning on decluttering series for next spring…and I know this challenge will help me in that! My most cluttered room is sadly our bedroom. It’s like the catch-all for everything (it used to be the guest room before kids….but now we don’t have one). It’s really sad. Our bedroom is not a haven for my husband! We had a wonderful, wonderful Babymoon getaway to a quaint little hotel/B&B this past weekend, and I told my hubby that I wanted our bedroom to be like the room where we stayed….but that will mean some WORK on my part! Can’t wait to check out the PDF!! Thanks so much for putting this together!!! We have been decluttering the last month, and plan to keep going. Already I am running out of places to store things for a yard sale! We have changed our focus, to look for those in need to donate to. Even the kids have hopped on board, and we are all feeling great about it! Very excited about this! My husband and I were just talking the other day as we were driving home from vacation about how we really need to de-clutter and get rid of a lot of STUFF. I’m in! I am so excited about this! We will probably be on an accelerated version since our baby is coming in less than 4 weeks but in this nesting stage I’m in, I’m all for it! 🙂 My husband will be so excited too! Thank you so much for the motivation and inspiration! It feels so great! It’s like you’ve lost weight….looking forward to every step of this challenge! I bet you’ll find even more that you want to get rid of and that is unnecessary, after having it all packed up for a while. Once it’s been gone, you sometimes realize that you didn’t need it after all, you know? Before beginning it is a good idea to consider what you will do with your giveaways. In my small town, for instance, there is a “take it or leave it” where you can drop of most any household item (small or large) but they won’t take bedding or clothing/shoes. These items would get taken to the local Thrift Shop. I think this is important or people might get into the swing of things and just take it all to the dump just to be done with it. One more thing: sometimes a library has a “free section” of sorts of older, dicarded or dontated resources. Books, magazines and movies might be best dropped off here. Thanks! I need to do this to prepare for a garage sale this fall, and the accountability with the facebook page will be great. This is a great challenge and I have already been thinking about and trying to simplify our lives. I did a lot yesterday and hope to keep going with the challenge. For me I would add one more question: Do I have a place for the item. I try to think about that when buying anything too. Where would I put it?? My dad used to say “a place for everything and everything in it’s place.” If it doesn’t have a place it will be the worst kind of clutter! Sara, we have the same problem with our extended family and I hold on to junk sometimes just because of them. I would love suggestions in this area too! Great question to add, Jessica! Knowing whether we actually have a place for something is definitely important to consider. Sounds like a great plan! I am looking forward to joining in! I decluttered a few months ago, so I am pretty happy with how my home is right now, but I am looking forward to reading this series! Your post made me start decluttering today. I found much more than ten things to throw away and I’m glad I did. Thanks, Stephanie! I’m so ready to start! Any advice for what to do with kids who collect. My 9 yr. old’s job is emptying the trash and recycling. I can’t tell you how many times that he digs out stuff to save. His room is the most cluttered place in the house. How do I convince him to part with his “treasure”? With my kids, I have placed limits by doing this: Each child has their own “special things” box. I was going to have them decorate them, but haven’t done that yet. They are allowed to keep whatever they want that is treasure to them in that box. Its accessible to them. When its full, they have to go through it and get rid of some things to fit something new in. I thought it might not work for them (getting rid of stuff) but it works great. They get to choose what to get rid of or not when the time comes that its full. I also have a seperate jar (well washed plastic jar) for rocks with the same concept. Just one caution- I don’t let them keep nature stuff in there, instead we have another open basket on the dresser for that. When I was a child, I collected chestnuts in a bag and kept them and they went moldy. Anyways- this system works SO well for us (3 year old and 6 year olds). If they want to keep something, I just say “put it in the special things box” or often, they tell me thats what they are doing. They even have told me that its full and they want to go through it so we set aside a time for them to do that. Oh, what great timing! I have been buried in my S.T.U.F.F. for too long. I have always been a bit of a collector, shopping at thrift stores and garage sales but never have my possessions been so demanding as now. The main issue is my troublesome thyroid and adrenals: they so affect my memory and energy that I do not even remember where important documents got placed or how to start organizing! I used to love getting organized, not that I always maintained it but I at least had the ability to get back on track. So. I’m in. As much as I can be in. I have been doing some random decluttering and have taken four boxes of books to the used book store (so far), along with about half a dozen boxes of shoes and clothes to the thrift store and another three bags to the consignment store. Progress yes, but not enough to SEE yet. Click to open the file. It should open in a new tab, as a PDF file. Then right click and choose the option to Save As. You should be able to save it as a PDF into a folder on your computer. Or, you can just print it out straight from the web browser. Yes, I forgot to mention freecycle, but you’re absolutely right, Bek! Thanks for mentioning that! I’m ahead of you. I did a huge declutter a couple months ago, as next yr we will be moving into a new house about 1/2 the sq footage of this one (by choice, not necessity). It was a HUGE job – we sold 10 boxes of bks to HalfPrice Books, and gave away close to 50 boxes and bags of stuff. I also filled probably the equivalent of three large trash bags. Everybody have fun – the effort is SO worth it when you get done! Sounds like you did an amazing job, Emily! It must feel SO good to have done it! This has been on my mind specifically as we just recently had to decide to move or not (for my husband’s job). We are staying the year, but likely that will mean moving summer 2013. I need to declutter over the course of this year. I’ll check out your list and see if that would help. I do find it challenging with the kids and with summer. (Family plans, visiting, summer preserving, gardens, and also, going through a challenging stage with my 3 year old etc). But perhaps breaking it into such small chunks I actually can do it. Just printed the PDF! Thank you for putting the time into such a nicely organized and compact document for us. I am excited to begin. Wish I was kidding… printed it and lost it. Glad it’s online! I am so in on this challenge! I have lots of clutter and the summer off to get rid of it! This is very timely! I’m all in! I was just doing this today! I was taking a break and was reading blogs and there yours is, talking about de cluttering.. with five children in a three bedroom upstairs (no garage, and min. storage) this is so necessary, I am so excited to keep going! We usually end up decluttering when we pack to move somewhere… which is way to frequent. I also do quarterly go through of the house when it starts feeling like there is too much stuff building up. BTW, a friend passed your link onto me and I have to admit, the main reason I stopped by was the name of your blog. For years I have been getting the offline publication, Keepers At Home, which is put out by some Amish / Mennonite families. Were you aware of it? Thanks for joining in, and for sharing this, Leah! I will be starting tomorrow!! I am ready for this. So glad I found your blog post. I started a FB page to track my journey. Thanks for the inspiration! Thanks for you post. I love that it’s detailed. I de-clutter regularly, but want to do a whole house kind of thing and always find myself not knowing where to start. I am starting this journey today. Thank you. I will definitely repurpose and use this list! We’re moving in about a month (hopefully) and my fiancé has collected so many things in the time he lived here. And then I moved in and brought things with me. 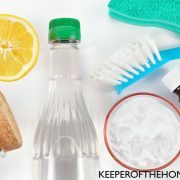 We’ve been meaning to start de-cluttering the apartment starting tomorrow, because then we’ll know whether or not we get the apartment we want, and this list will definitely help us stay organized. I know this post has been up for a while, but I’m hoping that you still check it. I just started the 8 weeks of de-cluttering and I have a question about de-cluttering pieces of appliances that you never use. Right now I’m going through my kitchen and I came across a box of attachments for my immersion blender. I use the blender, but have never even unwrapped the attachments and never will. What is the responsible way to get rid of the attachments? They are worthless without the blender as far as I can tell so I can’t see sending them to a thrift store. Should I just send them to the recycler? BTW, this blender was a gift. I would have opted for a single-piece appliance if I had purchased it myself since I have no need for the attachments. Single-piece immersion blenders are also more structurally sound. You know, in case any of you were thinking of buying one. That’s a hard call. You could try putting it on Craigslist for free. Sometime people are looking for something like the specific things you want to get rid of. I’m sure the attachments are hard to find, but someone who already has the blender may appreciate getting them. Otherwise, recycling is probably your best bet. I found you on Pinterest tonight, and loved this post! I will be starting this tomorrow. I have a ton of stuff to get rid of! 🙂 thank you!! Just found this! Love it so much. I sent it to my sister and sister-in-laws and now we are doing a friendly competition with money involved. If we all get rid of 400 items we will all be winners!! We are excited and all geared up to conquer our cluttered life! Thanks for your simple program. My husband and I started decluttering after 5 years living and working in our house. I’m a chef, author and he a photographer…we have lots of stuff plus a kid! No garage, just a shed and attic. He attacked the attic first and decided to make “collections” in clear bins from stuff around the house. For instance, the kiddos ceramic works of art (lots of them) we don’t need all of them around but can’t toss most of them. We will bring one collection at a time down from the attic. They are all labled, we ended up going through our house and collecting a lot of little stuff that was serious clutter!! It feels so much better! Thanks for the post, nice job. of the day. I love how you broke it down so that attention deficit people like me can easily focus on one small area at a time. Thanks! Hello! I’d like to get the Less Cluttered Home guide; however, I couldn’t get the PDF Guide. Is it a possible for you to send it to my email, please? 🙂 Looking forward to read your email. Thanks! I’m so sorry I missed this post earlier! I need to do this badly. Is the PDF no longer available? It seems like it would be a huge help. Thanks for all you share! Decluttering is always in the back of my mind. I have an area in my basement that I collect things for donation. As I come across things I want to get rid of, I take it right to the area. When it fills up, depending on what it is, we take it to the local Kiwanis, Habitat for Humanity, or the school District’s PTO thrift shop. A little over a year ago we moved to a condo from a big home and had to get rid of 1000 square feet of property. We donated about 25 van loads of items. We also had a garage sale and sold a number of things. We left behind 2 rooms of furniture and 10 sets of storage shelves for the new owners. It took me more than 40 days – probably 4 months total. Our new place has a fraction of the storage place as our house so it was a necessity to get rid of things. Yet, somehow I still find things to get rid of. I can’t locate the link for the pdf. please forward as this sounds what I would like to do. There’s a link in the post to the PDF file. There are no regular emails or anything, it’s just a file that you can print out and follow along with. I can’t seem to get the PDF to download or it’s not available. Is there another link to it? Thanks! 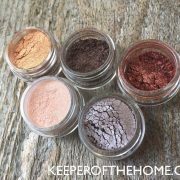 This is the link for the PDF- https://keeperofthehome.org/wp/wp-content/uploads/2012/06/8-weeks-to-declutter.pdf. It depends on which browser you are in. Some will pull it up as a file for you to download, while others will open it up as a new tab or window from which you can print or download. What about saving baby clothing/toys for future babies? I have tons of boxes of clothing that Im saving for another baby, Do I keep it and only keep what I really want or get rid of it and rebuy it when the baby actually comes? I definitely save children’s clothes for future babies. I just try to keep only the best items, the ones I really like that are in good condition, and then I store them in Rubbermaid bins that we keep in the garage or in closets. If you know that you still hope to have more children, or you have an older child growing out of clothes that a younger child could wear one day, I totally agree that it makes sense to save it! Use Space Bags for the baby & kids clothes you’re saving. I just started doing this myself. Saving lots of room! Have you heard of the book Seven by Jen Hatmaker? What you’re doing sounds very similar. She now has a Bible study to go along with the book. I’m hoping to declutter and simplify this year and look forward to using your resource to help! Thanks for sharing!!! Stephanie – I just linked to this entry on my new blog, because I’m attempting to eat the elephant that is my house. Hoping to get some friends to join in! Thanks for the inspiration and the pdf. Do you have tips for on how to handle a husband who is a borderline hoarder? My husband will not let go of ANY of his stuff. He has a lot of stuff, some of it untouched for 10 to even 20 years! This has resulted in some very bitter arguments. He has boxes and boxes and boxes full of clothes that are BRAND NEW, complete with tags. These clothes haven’t seen the light of day since he put them in the boxes. He is not a “fashion” oriented guy. He will wear the same three t-shirts until they are completely worn out. I can’t get him to part with a single piece of this unused clothing. Same thing for books and papers. He has so many books. He was an elite runner. He has shoes. Shoes and shoes and shoes that he was given, doesn’t exactly like, but won’t get rid of. Many of these shoes are brand new, never worn. Same for marathon t-shirts. He has like three boxes full of marathon t-shirts. He has books. Boxes and boxes and boxes full of books. His stuff is taking up all of my closet space and a good chunk of our spare bedroom. Ironically, he wants the house tidy, but considers it completely okay if this stuff is piled in the corner. FOR YEARS. I am not talented enough to make order when there is so much stuff tumbling out of every nook and cranny. Any suggestions??? Help! I’m no professional but I know there are often physiological reasons behind this kind of hording. My mom-in-law would buy new things and store them until the house was full and she wouldn’t allow anyone to move or sell anything. If he doesn’t want to talk to someone, you may have to seriously consider renting a unit. Hi Jennifer – I am a professional organizer, and the child of a hoarder. 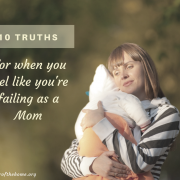 I have intimate experience with what you are going through, so I feel your pain! The critical missing element in the situation you describe is, your husband not really being in touch with the fact that this behavior is genuinely a problem. What is likely to help him stop hoarding, is some behavioral therapy, like the therapy suggested in the “Buried in Treasures” self-help program. This program is available in only a few areas, unfortunately, but you can read the book “Buried in Treasures” or the book “Stuff: Compulsive Hoarding and the Meaning of Things”, both authored by Randy Frost and Gail Steketee. The two authors are psychologists who went on to create the Buried in Treasures self-help program, which is still in its early stages in terms of growing and being available in more areas. In the books, they describe some of the therapeutic techniques. I suggest you read these books, and realize your husband has a disorder, and needs help to get past it. Hopefully with these books, you can provide that help, or some of the first steps of it. Also, Messies Anonymous is a good online community for self-help. 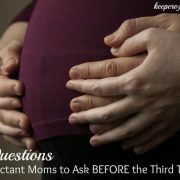 Please feel free to post any questions or follow-up on my website http://www.zeroinorganizing.com or blog (where I am more likely to see it than here). I wish you and your husband all the best. My man is just on the packrat side of the hoarder line. He doesn’t actually have an emotional attachment to any of his stuff, he’s just too lazy to go through any of it. In our last apartment (larger than this one), we had a second bedroom that I would sit in and go through his boxes of stuff. I got really into Freecycle and got rid of things I knew he wouldn’t miss; things like soft-side lunch boxes, land line phones, non-usb mouse and keyboard, etc. He’d come home to plastic grocery bags tied closed and labeled with someone’s name to be put out on the front stoop. If he didn’t see what was in the bag, he didn’t care what got donated. I also announced that he did not get to keep any clothes that were more than two sizes too small for him; so, since he’s a 3x, everything 1x or smaller got donated. He still won’t let me touch his CDs even though all his music is on computer, but we’re making decent progress. Good luck! I am with you. 25 years. It is hard. There are times I finally take things and box them and date them. When they’ve not been touched in a year, I donate them. The piles drive me crazy. I do ask him to tackle a specfic pile at certain times. If he doesn’t, I box it up and put it away. Most times he never even notices. Again, it is dated and disposed of in time. If you can afford a storage unit, I would pack it all in there and let it set for a year and then get rid of it. I do think the idea of a quilt with the tshirts woud be cool. I can understand some sentamental stuff, but that has to be minalmized. So sorry. I know it is very hard. I just want to get some ideas in saving money…. I have a mortgage, car note & school loans to pays but cannot seem to find a suitable plan to help myself save biweekly. Can u help me? Upon reading the PDF, I came upon a good partner to this project. Spend the 40 days clearing out the fridge, freezer, and pantry. Cook with the frozen meat you already have in the freezer. 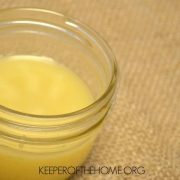 Have a grilled cheese and soup night where every member of the family gets to choose their own flavor of canned soup from the pantry. If you’re one of those people that makes meals and freezes them for a later crockpot evening, heat up those. If you can the food from your summer garden, come up with meals to use some of the tomatoes, relish, and jams. All these things have to be rotated through anyway, you might as well use your declutter time to do so. Thank you so much for making this printable!! I am NOT a natural organizer. I really have to work hard at keeping clutter under control. This will be a great tool for me to use again and again!! It is hard work to be clutter free. That I do do know!. I found one day I felt too overwhelmed by my own clutter that I made a conscious decision to be clutter free and organized in my home so that I could enjoy the extra space created by decluttering. and organization. At first it is hard to left go of sentimental things but it gets easier. Thanks for sharing your experiences. Just found this and wanted to say thanks for the pdf! Can’t wait to read it. I love stuff like this! When it gets to the point when your stuff begins to own you, that’s when you know you have a problem. Can’t wait until I have the time to dig a deeper into the pdf to see what I can do to fix the problem I have going on. Thanks! Word of caution when doing this – I got rid of several “old” sets of books that ended up being worth several hundred dollars per set! Also some “old” bud vases. Check that the items you are tossing don’t have a retail value before you just send them to the Goodwill or put them in the trash! Loved this pdf, but noticed something in your “After the Sale” section: You mentioned that donating clothes that are stained or otherwise in poor shape wasn’t really useful, but it’s quite the opposite. Larger donating facilities actually derive income from selling past prime textiles to companies that recycle them. The Salvation Army in particular tries to keep as much clothing out of the landfill as possible. Recycled clothing and textiles can be used to make products including, carpet padding; mattresses and upholstery; wiping rags; insulation and sound-proofing material for automobiles and appliances; as well as rugs and blankets. So please do donate those stained and past prime pieces! In 2012, our end walls in the basement started cracking, with the one beside the driveway buckling, dropping the main beam. Everything went under tarps! That year, I got rid of 3000 lbs of stuff, donating to different charities, recycling some and into the trash with some. The next year, while hubby was replacing the walls and painting, I started going through all our clothing (summer and winter) and donated 85 lbs of clothing out of my closet as I had lost 50 lbs of fat off me. In 2014 I went through all the cupboards, storage areas, linen closets, etc. We had 5 garage sales late summer/early fall. We also went though boxes of paper, including university books and notes. After shredding 12 big recycling bags, donating/selling books, we filled our recycling bin, and several of the neighbors’ bins as well. The whole point of this de-cluttering is we plan to move into a drastically smaller place in a much warmer climate. Now we must sell most of our furniture and the house. It feels like forever that we have done this and no extra space was showing. We realized that we had empty cardboard boxes in every nook and cranny that we no longer needed. One afternoon we broke down all boxes, filling our recycling bin, the neighbors bin and still had a pile in the garage. That is when we felt accomplished with empty closets shelves and cupboards.